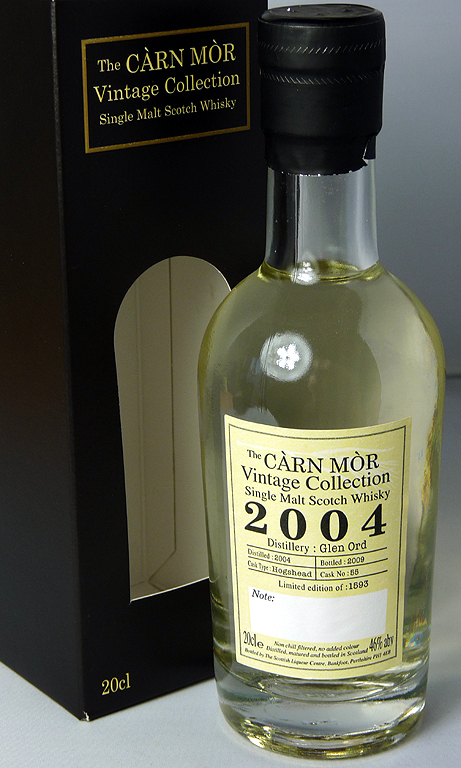 This Glen Ord is part of the 24 x 20cl bottles that make up the Carn Mor Vintage Collection. Distilled in 2004 and bottled in 2009, it’s from a limited edition of 1593, Cask No: 55. Non-chill filtered, no added colour and 46%. You can understand the thinking behind the Carn Mor collection. 24 bottles covering 24 years and 24 different distilleries is a nice idea. But I would argue these bottles are more for tasting and comparing the differences rather than collecting. My thinking behind this is when we look at the younger bottlings, such as this Glen Ord. The collection makes me imagine I own a distillery and, part of my duty is to taste the whisky as it matures – 3 years, 4 years, 5 years, etc. And in each year I sense the changes of the aging process. But instead of comparing the same whisky the Carn Mor collection has the added bonus (or complexity) of showing the effects of change from 24 distilleries. With this thinking in mind, it makes me wonder if the younger whiskies in the Carn Mor collection would have seen the light of day at their tender ages if it weren’t for the requirements of the collection? Is this Glen Ord a finished malt or is its value purely to contrast and compare against others in the collection? We will see when the stopper goes POP! This entry was posted in Glen Ord and tagged 2004, 20cl, 46%, C Gar Ltd, Carn Mor, Glen Ord, Highlands, NAS, Single Malt. Bookmark the permalink.